Served as a side dish or entrée, this Asparagus Risotto Recipe is sure to impress…and satisfy. I am almost certain even an Italian nonna would approve! 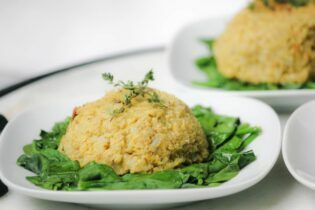 I initially made the recipe for a Meat Free Monday entrée, but it was so unbelievably good that I now plan to serve it as our starch for Christmas Eve dinner. Rich, creamy and decadent, just as any good risotto should be, nobody at the table will ever in a million years be able to tell that this Asparagus Risotto is also 100% whole grain and dairy free. Although you will often hear that you cannot possibly make a good risotto if you don’t use short grain Arboria rice (a refined white rice), that’s just not the case. 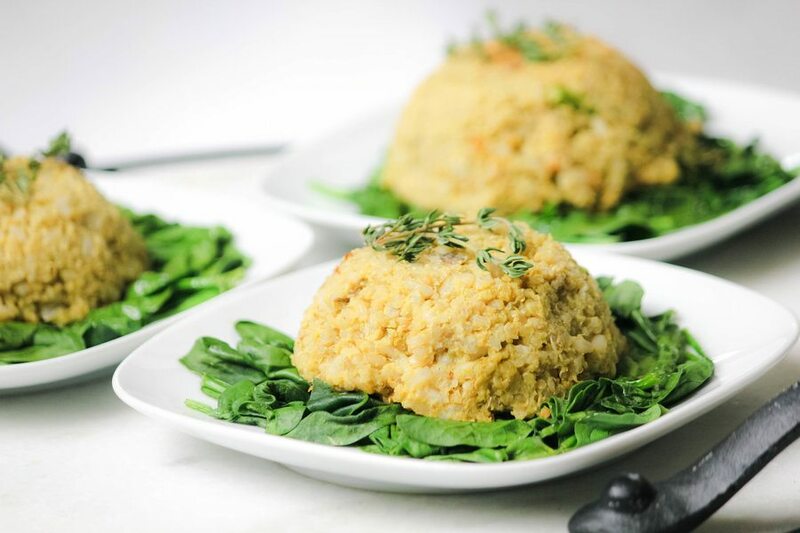 Arboria rice is used because it readily gives off starch as it is cooked and stirred, which then creates the much-sought- after indulgent creamy base from the stock. However, you can absolutely substitute short grain brown rice for the Arboria rice. The key is that it must be short grain brown rice. Long grain rice just doesn’t work. 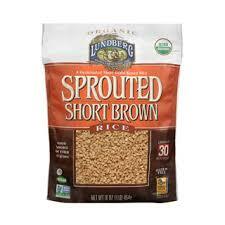 If you want even better results, I suggest using sprouted short grain brown rice, such as Lundberg brand (see photo above.) Not only will sprouted brown rice cook quicker and taste better, it’s healthier too! Anytime a whole grain is sprouted it becomes easier to digest and the nutritional value and antioxidant content of the grain is enhanced. Although you could easily make the asparagus risotto recipe entirely from the sprouted short grain brown rice, I like to add in a bit of quinoa too. Technically the name risotto means “little rice” in Italian and so the addition of quinoa is definitely not a conventional ingredient in mainstream risotto recipes. I like to add it anyway because it blends right in with rice. And just like with the rice, I like to use sprouted quinoa too (although regular quinoa will also work.) By the way, I have another recipe for a brown rice and quinoa risotto HERE. Believe it or not, “Asparagus Cream” is what gives the asparagus risotto its decadent, richness without butter or cream. I realize the sound of “asparagus cream” might not sound all that good, but you will truly be amazed at how flavorful and downright delicious it actually is! The “Asparagus Cream” is made by cooking fresh asparagus and garlic slices with vegetable broth and then pureeing everything with raw cashews in a high speed blender (my favorite is Vitamix). You end up with a rich “cream” that is both complex and subtle in flavor all at once. It’s quite amazing really! Note: The Asparagus Risotto recipe serves 8 as a side dish or 4 as an entree. If serving it as an entree, I like to add an additional side of steamed asparagus along with a soft boiled egg on top of the risotto. Put asparagus stems and half of the sliced garlic in a large skillet with 1 cup of the vegetable broth. Bring to a boil over high heat. Reduce heat to medium, cover, and cook about 5-minutes, or until the asparagus is bright green and somewhat tender. Remove the skillet from the heat and set asparagus and liquid aside to cool for a few minutes. Transfer the cooled asparagus and cooking liquid to a high speed blender (I like Vitamix). Add the cashews. Process on high until mixture is smooth, creamy and lump free. Set “asparagus-cream” aside. Heat the same skillet over medium-low heat and add the olive oil. When the oil is hot, add the onion, remaining cloves of sliced garlic and mushrooms. Sauté until onion is golden, about 10 minutes. Season with salt and white pepper to taste. Add the rice and quinoa to the skillet with the onions and mushrooms; sauté about 1 minute. Add the wine and simmer until it has been completely absorbed, stirring constantly and slowly. Add the remaining 3 1/2 cups of vegetable broth, 1/2 cup at a time, to the skillet until all of the stock has been absorbed by the grains, continually stirring. Season with salt and white pepper. When you have added all the broth and the rice and quinoa are still slightly firm but tender, add the reserved “asparagus cream” and uncooked asparagus tips. Stir well, cover and cook for about 3 minutes. Season once more with salt and white pepper to taste. Serve warm. Hi, Ivy, and thanks for this amazing-sounding recipe! I discovered your website a few weeks ago while researching prebiotic foods and am now doing your 8-Week Challenge. The changes have already been amazing; I have so much more energy and just feel better, and never have cravings. I’m losing weight and inches and am excited to see more progress. I have a question for you about mushrooms. I am sensitive to molds and fungi, so they are prohibited for me, along with fermented foods. It makes me sad, because I know mushrooms have so many health benefits, and I wish I could eat them. Are there any good substitutes for mushrooms (whether in terms of nutrition, or texture) that you know of? Or maybe it’s safe to just leave them out of most recipes where they’re included (unless mushrooms are the centerpiece, of course, in which case those recipes I just have to avoid). Hi Leslie! I am SO happy you found us and thrilled to know you are doing the Challenge =) I would LOVE to share your story when you finish if you are up for it. Our readers love the success stories! No worries if you don’t want to share it publicly, but just thought I would ask. As for the mushroom substitution, hmmmm….that is a GREAT question! Gosh, I really and truly cannot think of anything that I have tried as a substitute (I am wondering though if maybe ground tempeh might work since it has a somewhat “meaty” texture and earthy flavor) –I did however find this blog post with a number of different ideas: http://www.thekitchn.com/what-is-a-good-substitute-for-mushrooms-17932 See what you think? If you find something that definitely works please do let me know…. Wishing you the best of luck on the Challenge! Thanks Ivy! I’ve got a long way to go yet, but it’ll make a great success story when I’m done. 🙂 I’ll check out the link and see what works – tempeh is a good idea too.